Gardening is a time-honored tradition, but luckily, we live in an era where water flows freely from the tap (can you imagine hauling all the water you needed for your garden by hand?). Modern environmental concerns mean today’s gardeners need to consider their water footprint in the backyard. Water-wise gardening isn’t about simply reducing the amount of water you use—it’s a whole garden-initiative. The quality of the soil, the type of plants you choose, and even how you plant them can all have an effect on your garden’s water footprint. That means you need to strategize on all fronts—the layout, the soil structure, the way you water, and where you get your water from. To get you started, here are some tips you can use to reduce your use and get a beautiful, healthy, thriving garden with less watering. A truly water-efficient garden works like a well-oiled machine—all the parts work towards the goal of reducing your water footprint, including the soil you use. Not all soil types retain water equally, however. 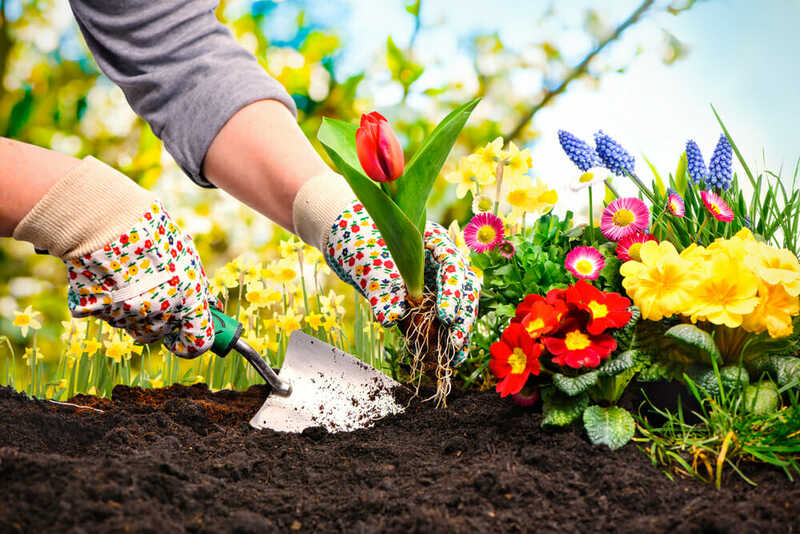 For instance, if the topsoil in your area is naturally sandy or has high clay content, you’ll get better moisture levels in your garden if you work in plenty of organic compost before you plant. In fact, if the soil in your area is naturally very poor, plan on adding up to six inches of compost every spring. Another soil addition that may help with water retention is biochar—a mixture of organic material burned to create organic charcoal, which can be worked back into the soil to absorb water. Agricultural use of charcoal dates all the way back to prehistoric times, when Amazonian tribes added it to their fields as a matter of practice. However, it’s been proven to boost soil moisture and quality by modern scientists as well. The reason it works is that organic charcoal forms carbon bonds with soil nutrients, so less are washed away when you’re watering, and it contains small pockets that more readily absorb water. You can make your own, but generally it’s best to let the professionals handle the job, especially if you’re in an area that’s facing drought conditions or burn bans. You can buy ready-made biochar online or at any gardening supply store. Keep in mind that biochar is still being studied by modern permaculturists, and adding it improperly can seriously alter your soil composition. Therefore, it’s best to familiarize yourself both with the pH and type of soil in your area before you begin, and always follow the instructions on the package (this primer from The Washington State University Extension is also helpful). Additionally, follow the old adage of “less is more,” and use less charcoal than you think you need. Most people tend to plant just about whatever they want to in their gardens, which leads to quite a few problems. First off, it makes it harder to garden in general, since non native plants require more care and attention in order to thrive. If you live in an arid or semi-arid climate, it can mean draining the water table of gallon upon gallon of water to keep those exotic species alive. Getting started with native plants requires you to overcome a small learning curve—you’ll need to familiarize yourself with your area’s climate and what grows best there. And it can mean adapting the aesthetics in your yard, too. If you get really into native landscaping, you may find yourself trading in grass lawns for carefully-selected beds of local cultivars. If you’re wondering where to begin, your area horticultural society or university extension is a good place to start. They often have the best regional-specific information about what plants are best for your locale. However, the EPA’s WaterSense site also contains a list of resources organized by state to help you learn about the kind of plants that will thrive in your area with minimal watering. 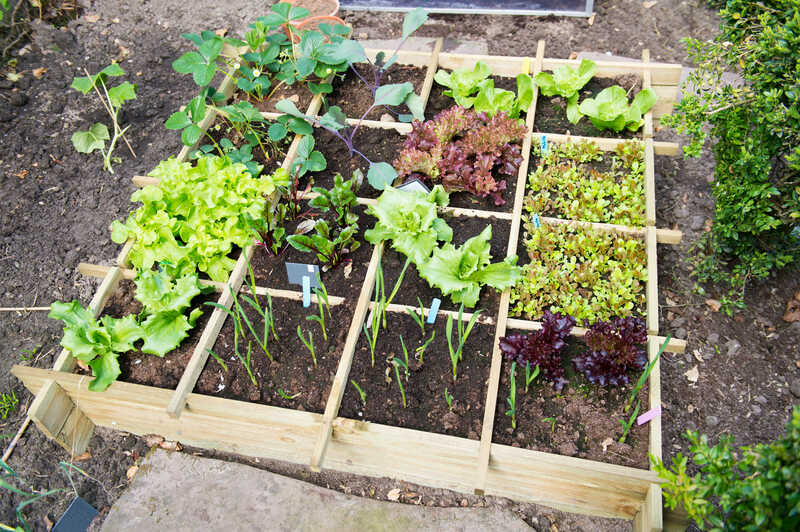 Especially in vegetable gardens, our notion of the ideal garden setup is often a long, luxurious row of fresh edibles. As it turns out, however, this isn’t exactly the most efficient way to do vegetables, from a watering-standpoint. A block or close-row system is a much less wasteful design. This is where plants are clustered in small, often raised, boxes of like vegetables, instead of strung out in long rows. Beds are three to four feet wide and of variable length, and plants are grouped in blocks that span the width of the entire bed. This has the effect of shading the soil, locking in moisture that might otherwise escape in wide-spaced rows. Tight-knit plants also help root out weeds, so you’ll get to focus more on the fun parts of gardening. Speaking of exposed soil, there are definitely times in a garden where it’s inevitable. That’s where mulching comes in handy—a layer of organic material spread over the surface helps keep moisture where it should be, under the soil, instead of losing it all to evaporation. It’s important to be particular about the kind of mulch you lay down, however, since some types, like those made from shredded cypress trees, can actually deplete threatened wilderness areas of important plant life. Pine needles, grass clippings, and even fallen leaves all make great organic alternatives—and they’re free, too! If you don’t have enough of any one of those to go around, try to look for bark mulch, which doesn’t require a tree to be cut down to make it. Spread mulch in a layer measuring between 2 to 6 inches (you can error on the thicker side if you’re mulching around tree roots or underneath shrubs). One way to make sure you’re not drawing any water off the water table is to take it all from a free, natural source: the precipitation that falls around you. Collecting this rainwater in a set of barrels or tank will allow you to store it for later use and avoid depleting our supply of drinking water. Most tanks and barrels have a hose hookup, so you can attach your hose directly to the barrel in order to water. Place barrels in a line below a gutter downspout—the gutter acts as a funnel to pipe the water directly into your collection tank. If you have multiple barrels, make sure to swap them out often, particularly during the rainier spring and fall seasons, so you can maximize the amount of water you collect. If you’re trying to be more water conscious in your garden, it may seem wasteful to treat your plants a long, luxurious soak, but it’s actually more efficient in the long run to give plants a good, deep watering than a short, quick blast with the hose. Soil that hasn’t been watered deeply—where the water doesn’t penetrate much beyond the first inch or two of topsoil—will dry up quickly, requiring you to pull out the hose on the regular. Always water in the evening or early morning, when the sunlight is less direct and won’t readily dry all the moisture. Not only will this give your plants a chance to soak up the water before it evaporates, it will also ensure that water droplets on the foliage don’t scald leaf surfaces. Use a hose nozzle with flow control settings so you can give your plants a gentle soak rather than blasting them with a full-pressure stream. 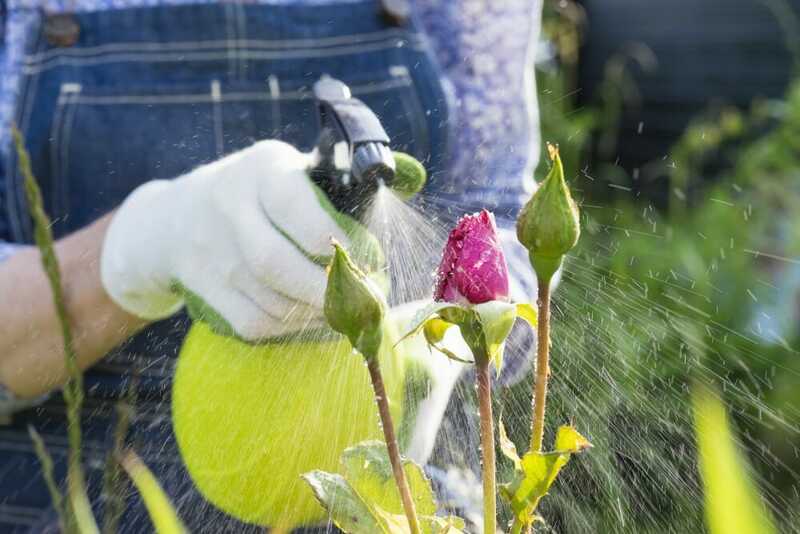 Ideally, you should keep spraying until you reach a water depth of about 8 inches (you can check this by digging a small hole with a trowel to that depth about an hour after watering). A last idea to get your watering efficient is to let a computer handle it. Automated watering systems, such as WiFi-connected sprinkler controllers, can sync with weather forecasts and test moisture conditions in the area to make sure you’re getting the most out of your watering. When your plants need watering, the system does it for you without you having to turn on the tap. Even if you’re not ready for a high-tech sprinkler system, water sensors placed near plants show great promise, and can connect to an app on your phone to send you an alert when it’s time to water—before plants start to droop and wilt. Sensored devices may actually be more accurate at detecting water conditions than we humans are, and home automation is a developing field, so these items are definitely something to look for in the future if you’re hoping to save water. In the meantime, an all-natural water-wise approach can make your garden more efficient, and cut back on your water bill, to boot! DIY Outdoor Kitchen	How to Plant a Garden Butterflies Will Love	The Benefits of Using a Solar Water Pump in Your Garden	Ask an Expert: How Can I Keep Wildlife Out of My Home? What Are Your Best Eco-Friendly De-icing Options?